Sometimes you don't need a full sized kit to focus on the little stories of the day! Wrap up your sweet memories in this fun playset designed to give you all you need to tell the story at a mini-price! Inside you'll find: 12 patterned papers, 5 solids and a variety of themed pretties including chocolate styled Word Art, candy conversation hearts, 2 heart balloons, a bow, 2 brads, 3 journal labels, an arrow, Cloud 9, a box of chocolates, a calander date, 4 flowers, a branch of leaves, heart shaped glasses, a candy kiss, 5 lollypops, a love note colored 2 ways, a strip of ribbon, 9 word snips, and a Valentine pick. 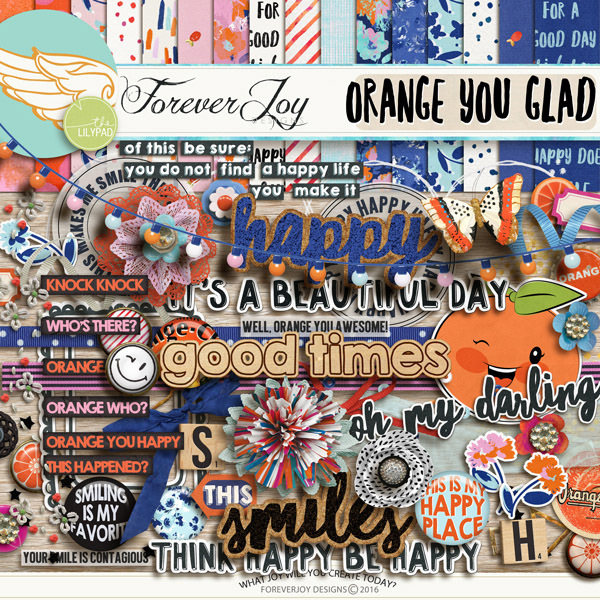 Enjoy the pretties and paper together in the page kit! Inside you will find 18 patterened papers, 5 bonus slids and over 60 detailed pretties including enameled baby and little critter pins, a sweet banner of onsies, a branch of baby breath, 2 differnt baby block styled word art, a little felt teddy bear, 5 brads, 5 flowers, two gem buttons, 2 frames, a litle heart, a fern branch and a berry branch, tiny diaper pins colored 3 ways, a measuring tape, 2 strips of ribbon and two tiny bows, a rubber duck, a doily, a wood clothes pin, a vintage flash card, 3 spool toppers, 2 cork spots, toy baby rings and 13 pieces of word art. *not all items are shown in preview. This item coordinates perfectly with the other MARCH 2017 BYOC products! Drop shadows for illustration only. This digital kit has been saved as .png files at 300 dpi. Not all items shown. Personal Use Only please. Add some fresh vintage flair to your layouts with this pack of 15 thread spool tops! Drop shadows for illustration only. This digital kit has been saved as .png files at 300 dpi. Not all items shown. Personal Use Only please. 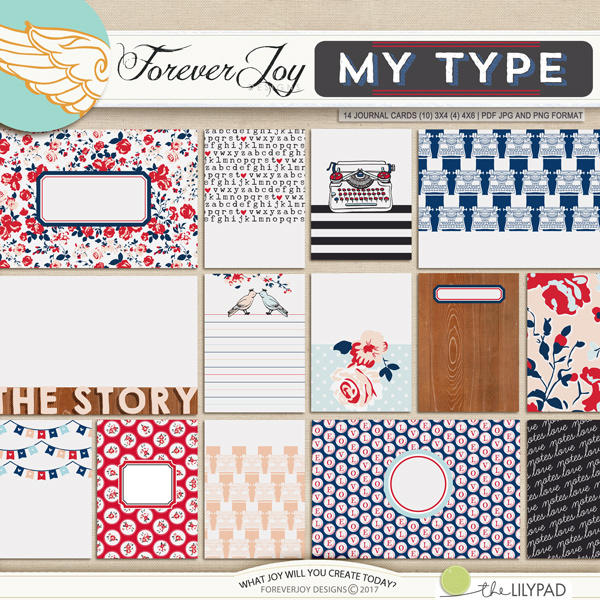 The page kit includes both papers and pretties! Inside you will find 15 patterened papers, 5 bonus solids and over 60 detailed pretties including sweet cork styled love birds, a canvas banner, a string of love beads, an alpha border with a hidden message inside, a book card, 2 book stickers, 2 bows, 4 buttons, 2 binder clips a hand drawn typewriter colored 3 ways, a little charm, a doily, 6 strips of dymo tape, 5 flairs, 4 flowers and 4 flower stickers, a journal lable colored 4 ways, 2 colored leaves, a colored pencil, 4 sentiment strips, 4 strips of washi and 11 pices of Word Art *not all items are shown in preview. Drop shadows for illustration only. This digital kit has been saved as .jpg and .png files at 300 dpi. Not all items shown. Personal Use Only please. In a world of perfect red roses, sometimes it's nice to stand out with your own special bloom- To be wonderfully and perfectly quirky and YOU-nique! That's the spirit behind this design filled with dessert rose, sage green, sky blue and wood grain tones and loads of inspirational word art designed to prompt your joyful memory keeping. Included in the Page Kit are: 20 papers (15 patterned and 5 solids) & the following pretties: 2 chalk-art banners, 1 delicate knit banner, 2 bows, 4 brads, a little leaf branch, 1 resin butterfly, 3 buttons, 3 sweet cactus stickers, cork chevrons, a little clay pot for planting as you wish, 3 cork spots, 2 knit flowers, 2 flower stickers, 5 various flowers, a strip of delicate white tulle, a little blooming branch, 3 strips of washi, a watering can charm, 11 pieces of word art and one wood slice word art. Drop shadows for illustration only. This digital kit has been saved as .jpg and .png files at 300 dpi. Not all items shown. Personal Use Only please. "KNOCK KNOCK! "who's there?" "ORANGE" "orange who?" "ORANGE YOU GLAD IT'S ME?" 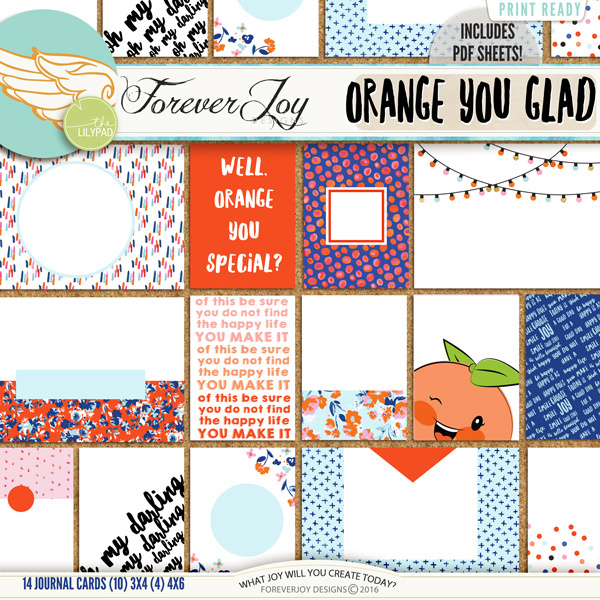 Included in the Page Kit are: 20 papers (16 patterned and 4 solids) & the following pretties: 2 arrows, a scattering of beads, a trim of orange blossom stitches, an orange pop bottle cap, 2 bows, 5 brads, a little butterfly, 3 buttons, file tabs noting "good, better, best", 4 flairs, 5 flowers, 3 flower stickers, 2 frames, a branch of leaves, one orange cutie sticker, a vintage orange milk cap, a small resin orange slice, 3 paint spots, a string of party lights, 4 ribbon, a scattering of stars, number tags (1-3), a ticket to good times, 2 lettered game tiles (H and S), a bit of light blue tulle, 2 vellum word spots and 11 pieces of word art. Drop shadows for illustration only. This digital kit has been saved as .jpg and .png files at 300 dpi. Not all items shown. Personal Use Only please.